#660 Combination Car with an extruded aluminum shell made from 1950-1952. Here's an oddball factory error: the door is cut in the wrong end of the car! And if you think that's odd, here's one for you: the day after I posted this, someone else sent me another one! I later discovered that this is variation D in the 1991 edition of Greenberg's Guide. In 1952 Gilbert switched from aluminum to chromed plastic. Most were made of black plastic, but mine is white plastic. If we ever did another edition of the guide, I'd distinguish between the two chrome types." 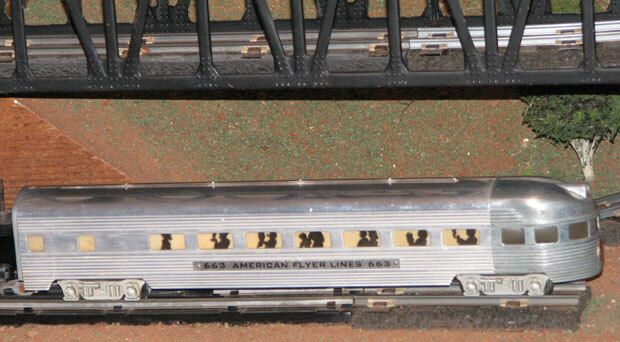 #661 extruded aluminum Coach Car made from 1950-1952. #661 Shiny Chrome Coach Car made in 1952. There was also an extremely rare satin silver painted version made in 1953. This one is listed in both Greenberg and the TM Guide! So when I saw this dull finish 661 Coach Car for sale on ebay, I got excited. I couldn't tell whether it was dull chrome or satin, but Greenberg said both were very rare. which means it could be the satin version acknowledged by the TM Guide. I was so focused on the finish that I missed the obvious signs that this is actually a repainted chrome car. the person who repainted the car masked only that word and not the entire chrome panel. The chrome cars have a chronic problem with flaking so a lot of people repaint them. #662 extruded aluminum Vista Dome Car made from 1950-1952. Here's the shiny chrome version made in 1952. Mine is the frosted chrome version; compare it to the shiny chrome 662 above. #663 extruded aluminum Observation Car made from 1950-1952.
but Heimburger says it "is not known to exist" and it does not appear in the TM Guide. Greenberg's 1980 edition reports both the chromed plastic and lacquer-chrome versions. but neither Heimburger nor the TM Guide acknowledge their existence. The aluminum cars were sold in six sets. #1199 Woodie's Special sold in 1956. It was the only train sold with all four aluminum cars. 18 #700 straight track, 4 #701 half straight track, 27 #702 curved track, and 3 #703 half curved track. #5008A De Luxe Diesel Streamlined Passenger Set sold in 1950. It had a #660 combination car, #662 vista dome car, and #663 observation car, but no #661 coach. 6 #700 straight track, 12 #702 curved track, and 18 #693 track locks. The nearly identical #5008 set came with the harder-to-find chrome #362 engine set. #5011 Union Pacific Passenger Train set sold in 1950. It had a #660 combination car, #661 coach, and #663 observation car, but no #662 vista dome car. #690 track terminal, 6 #700 straight track, 12 #702 curved track, and 18 #693 track locks. The nearly identical #5011BBW came with a #332DC engine and #577 whistling billboard. #5108W De Luxe Passenger Set sold in 1951 and 1952. The chrome cars were sold in four sets. #5205W shiny chrome Silver Streak sold in 1952. It had a #660 combination car, #661 coach, and #662 vista dome car, but no #663 observation car. 2 #700 straight track, 12 #702 curved track, and 14 #693 track locks. 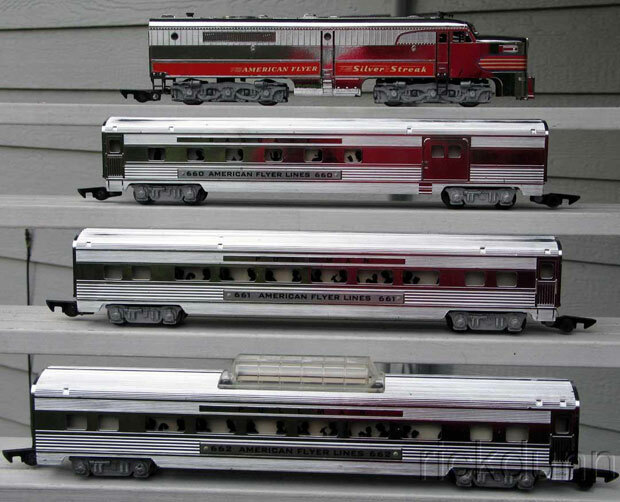 The #5205W Silver Streak set was also sold with frosted engine and frosted chrome cars in 1952. 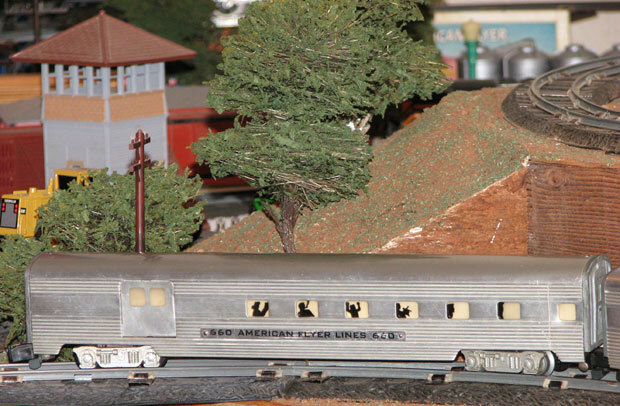 The nearly identical #5205WCX Silver Streak was sold in 1952 without track locks. #13SP sold in 1954.came with a #660 combination car and two #661 coach cars. #50 District School, #166 Church,.#275 Eureka Diner, and #585 Tool Shed. a red #650 New Haven coach, and #735 New Haven anumated coach. #704 manual uncoupler, 2 #700 straight track, and 12 #702 curved track.